ADDIS ABABA, Aug. 30 (Xinhua) -- After she finished grade 10, Selamawit Kegna's parents started looking for a groom for their daughter because they thought since she was not a good student she would not be able to support herself. Then a friend told the teen how she could earn her own livelihood. A Chinese-owned jeans factory in the Eastern Industry Zone on the outskirts of capital Addis Ababa was looking for workers. "I came and applied for a job at once," the 19-year-old said, sitting in front of a sewing machine in the factory. After three weeks of training, Kegna was officially recruited. Now as a seamer, she earns 1,500 to 2,000 Ethiopian birr (ETB) (55 to 73 U.S. dollars) a month, and is looking forward to a totally different life. Kegna is proud that the pairs of jeans she and her colleagues produce not only serve the Ethiopian market but can be also exported to other African countries and even Europe. "I often get bonuses, which really encourages me to work better," she said. The factory employs over 300 young people who are mostly from nearby areas, with the majority of them being women. "I have a savings account now and deposit 700 ETB (26 dollars) every month. I am also paying my own expenses," she said. "The way things are going, I will be able to buy a sewing machine after a year and half. Then I may return to my hometown and open my own shop. I can make uniforms for schoolchildren and clothes for other people." Kegna also plans to continue her education once she saves enough. The Chinese-built industrial zone, the first of its kind in Ethiopia, has been attracting young people from nearby agricultural towns. While Ethiopia is one of the fastest growing economies in Africa, it is still one of the poorest, with a per-capita income of 783 dollars a year, according to the World Bank. The Chinese factories in the industrial zone not only provide jobs for young Ethiopians, but also give them the perception of a career. After getting a degree in economics from Mekelle University, 22-year-old Seble Assefa looked for a white-collar job. But though she spent a year trying to land a suitable job, she couldn't find anything. It made her join Shanghai Textile's factory in the industrial zone as a temp. Initially, she received a monthly salary of 1,500 ETB (about 55 dollars), which was lower than the average for a graduate. Still she thought herself lucky, considering that she had been unemployed for almost a year since graduation. In two months, Assefa was promoted as a line supervisor and today, she is in charge of 60 workers. Her salary has gone up by 1,000 ETB (about 37 dollars) a month and she has more training opportunities. "I learned one important thing here -- always strive for better opportunities," she said. "I am no longer looking for a job within my academic background. I am now looking for further opportunities in the textile and garment sector." She thinks there is great potential in the sector in Ethiopia. "God willing, I will have my own sewing machine and shop in the near future," she said. Ethiopia's textile and apparel industry has experienced major developments in recent years, thanks to the wide availability of raw materials, cheap labor and low energy costs. 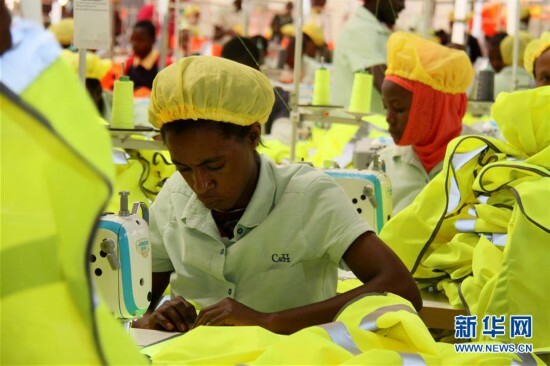 Ethiopia wants to become a textile and apparel hub in Africa, giving the sector top priority as it strives to become a middle-income country by 2025. For that, it envisages strengthening cooperation with China. The Chinese-built industrial zone, inaugurated in 2010, currently hosts 83 factories. The government frequently commends it as a cornerstone of the transition from an agriculture-based economy into an industrial powerhouse in the next 10 years. Chinese investment plays an indispensable role in Ethiopia's industrialization drive, President Mulatu Teshome said when he visited the Eastern Industry Zone in mid-August. "A decade ago, the land the Eastern Industry Zone currently lies on was just agricultural land. But with hard work, it has become ... a showcase of high-quality industrial factories in sectors such as pharmaceuticals, pulp and textile," Teshome said. The industrial zone is a positive impetus that is motivating Ethiopians to dream of a better future, the president said. "I hope our local entrepreneurs will learn from the success of the Eastern Industry Zone and take this opportunity to enter into the manufacturing sector."